I have been asked to share some ideas on lunch and snack packing for school. I have been making the kids lunches and packing them and their snacks the day before to maximize the time in the mornings!!! It works for me and I love it. I posted the photo above on Facebook yesterday of my new habit and one of my friends asked me for lunch and snack ideas. It was easier to blog about it then answer her on Facebook. Jill ... this is for you!!! First of all I will say that it was not my idea to pack it all the day before. But ... it is a great one!!! It takes the pressure off of me in the morning and making it in the afternoons definitely makes the witching hour and bed time smoother. And I am just plain lazy. Once I tuck the kids in at night I rarely go back down stairs. At this point of the day I love to hang in my room. I blog, I read and I hang with Lawyer if he is in town. I have been making lunches and snacks while the kids are doing their homework after school. They come in off the bus, have a snack and do their homework. I am available if they need me and the lunch boxes are clean and ready to be filled. Once the lunches are made I refill the lunch boxes and they go back in the frig until the next morning. Wham bam ... thank you ma'am. Done! Snacks ... I am a mom who packs a salty and a sweet, or basically a salt and a fruit. If they have a big fruit like an apple then their salty is tiny ... like 1/2 of a Z bar. If they have a larger salty ... then they get a box of raisins or a few strawberries. My favorite fruits to send are apples, clementines, strawberries, grapes (when the fat ones are in season), raisins or squeezable apple sauce. I buy the small apples ... you get a lot in the bag and they are plenty for a snack!! Bananas are a complete no go!! I also trade out fruit for squeezable yogurt. If its frozen it stays cold until afternoon snack time. MHM has snack time in the middle of the day since her lunch is at 10:25 am. Here is MHM's snack for tomorrow. I let her match her fruit and salt for the week and then bag them. She tries to get creative. It is fun to watch!!! WPM is all about the salt. He loves crackers and any other carb and my goal is to squeeze the protein in. He goes thru fazes. For a while it was popcorn, then hard pretzels and cheese and now its Ritz crackers. He took them with cheese for two days and today he asked me to pack them with pepperoni. 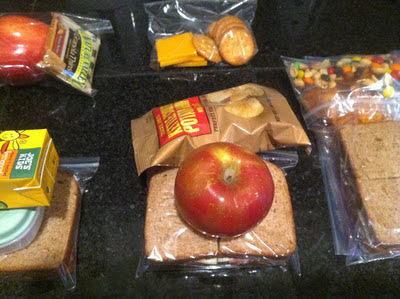 Lunches ... each kid is different. They all like the same food but they ask for different things. MHM will eat peanut butter and jelly or ham and cheese. WPM only eats ham, cheese and mayo. Once in a while he will ask me for a peanut butter and banana sandwich but he is a creature of habit ... so ham, cheese and mayo it is. HSM will eat anything including the bag if I let him. I usually pack him a ham, salami and provolone sandwich for lunch and a pb&j for snack. He also gets barbeque chips and a yogurt. Sometimes I pack him a pimento cheese and ham sandwich or tuna if its made. MHM will also eat these ... but she says the other kids look at her funny. If they want chips they get a 1/2 sandwich (all but the teenage boy) and then I match it with a fruit and drink. Either water or I just sprung for Trader Joe's lemonades this week. MHM reported that they were fancy and WPM reported they were for girls. Hmmm ... he will be getting water again. Once in a while I completely branch out and send soup. The younger two love tomato soup and cheese sandwiches. I tried for a while to send wraps and other things and Lawyer made me stop. He insisted I was feeding his children untradeables. He's a joy!!! I hope that helps Jill!!! Hugs to you and that cute boy of yours!!! Now I need that rosemary chicken recipe you gave me ... I think it was rosemary chicken! Thank you to The Paiges for all the suggestions and tips! My little is such a picky eater, I have a hard time making him something delicious and nutritious! Based on your needs, you can buy packing cubes in three different sets: single, 2 pcs, or 4 pcs set in different colours to allow different family members to be able to share the same luggage.